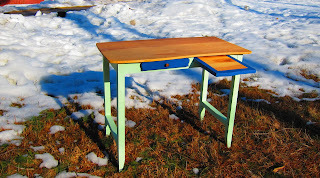 I'm Jay and I have a small woodworking shop/studio at my home in Maine. I make furniture and woodworking projects mostly from reclaimed lumber. I use Milk Paint for color and finish everything with a non-toxic, no-VOC linseed oil / beeswax. Most everything I make starts with a crayon drawing. There's something about the colorfully clunky lines that makes my inability to draw not seem so displeasing. I just start with what I know and with what is familiar to me and just have at that blank page... or pavement. Sidewalk chalk has also become a new favorite. (For pretty much all the same reasons as crayons.) Though I can't keep what has been drawn on the driveway for any longer than it takes for the next rain cloud to come showering by, it does give me a chance to quickly try out new ideas. I want my woodworking to have a sort of hand-drawn look. I want the sides of cases and the legs of tables to be playful and colorful and to not take themselves too seriously. I'm asking for support so that I can bring more of my sketches to life. I'm looking to present my work at shows across the state and have my pieces in small shops in our area. It's your funding that will enable Dead Apple Farm Furniture to become a thriving shop. To thank you for your support, I've come up with a few items I've chosen to make that I think you will enjoy. Please help me spread the word. I'll be blogging about a Blanket / Toy chest I'm building; showing start to finish the way I come about making a piece. I hope you can join me for the next 30 days! Thanks so much, Everyone! Finished with Non-Toxic No-VOC Milk Paint and Oil Finish. Writing Desk with the perfect height for Laptop typing!